White Center finds itself a city divided — literally, down Roxbury Street — by the price of pop. Mohamed runs West Seattle Halal Market, a two-aisle store specializing in meats and poultry butchered according to Islamic rules. A few shelves in the middle of the store, though, are given over to a popular side product that now has his neighborhood, White Center, literally divided. “Here is the precious fluid,” Mohamed laughs, showing me around the store. He holds up a two-liter plastic bottle of Coke. He once sold it for $2.79. Now it is $4 — a 43 percent increase, due to the city’s new tax on sugary beverages that went into effect Jan. 1. Customers, including immigrant kids who don’t yet speak much English, all seem familiar with White Center’s new dividing line, Mohamed said. 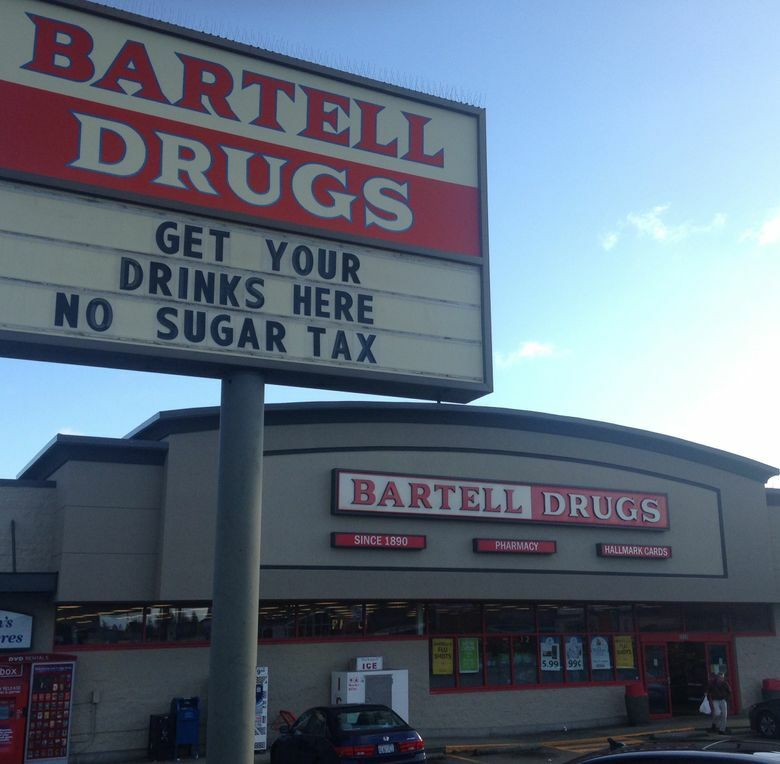 I don’t have strong views one way or another about Seattle’s new soda tax. I’m reserving the full force of my ire for when they jack up the tax on beer. Mohamed said he, too, sees both sides: the health case for taxing soda more, and the business argument that it could harm small markets in the city. He predicts he’ll survive either way, as sugary drinks are a small slice of his sales. But what’s interesting about his story is that it shows how incredibly price sensitive people appear to be. And also, how White Center may be an example of what economists call a “border effect” — a market distortion when there’s a price disparity across a boundary that customers can easily cross. But some studies found that while liquor sales in bordering Idaho counties shot up by more than 10 percent, booze sales on our side did not drop (and have since increased by 22 percent). So the huge price hikes, combined with the border effect, may have surprisingly contributed to an increase in total liquor consumption. Why? More availability for one thing. But also, when you make a “lure-of-the-deal” run for the border, you maybe end up buying more than you would have if the price had never been raised in the first place. Now soda ain’t liquor. But some of the anecdotes out of White Center make it sound like the old Rat City is on its way to becoming Coke Town. “Stores just down the street are advertising for people to buy drinks there because they don’t have Seattle soda tax,” lamented one White Center pizza-store owner, her shop 25 feet on the wrong side of the soda line, at a recent news conference. A team of UW researchers is beginning a four-year, $2 million study to judge the tax’s effects. That’s good, as the city’s grasp of the situation seems a little suspect. It suggests, on its website, that customers somehow shouldn’t even have to pay it. I mentioned that to Mohamed. He pointed up his block, toward a line that was invisible to me, but clear as paint on the street to him. “Then why they all walking by to the other side?” he said.